We've been making a conscious effort to have fish at least once a week (because of all it's goodness and health benefits), but it's sometimes a challenge to come up with innovative ways to prepare it, so we don't get bored of eating the same thing again and again. I usually make a fish curry, bake it or steam it but today thought of trying something different. Pour the stock into a pan (large enough to cover the fish but not to submerge it). Add the bay leaf, peppercorns, chilli and garlic cloves. Bring to a boil and then reduce to low to simmer. Season the fish with salt and pepper (season lightly if using stock cubes) and add to the stock. Cover and cook for 5-7 minutes or until the fish is cooked (flakes easily). Spoon over the stock on the fish occasionally. Remove the fish and cover with foil to keep it warm. Strain the stock and bring to a gentle boil. Add the butter. While stirring continuously, add the flour slowly to avoid lumps. Season, as required. Cook the stock till it thickens to form a thick sauce or gravy. 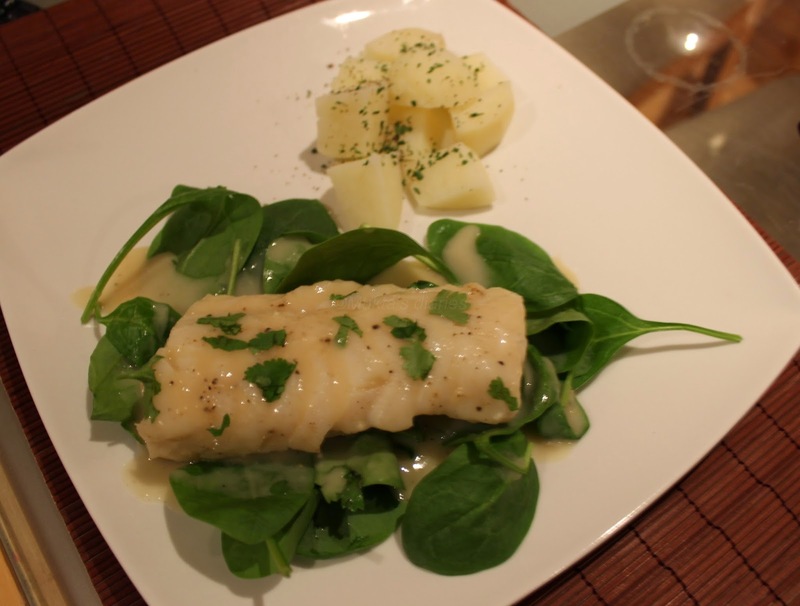 We had this lovely poached fish served on a bed of spinach, drizzled with sauce and some boiled potatoes on the side.